ESCP Europe Wirtschftshochschule Berlin e.V. is a state-recognized academic institution according to German law. It is part of the ESCP Europe: a transnational school of higher education with campuses in Germany, France, Great Britain, Italy, and Spain. 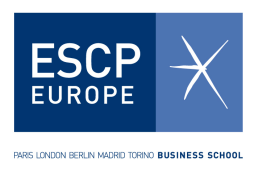 Established in 1819, ESCP Europe is the world’s oldest business school. It is triple-crown accredited (EQUIS, AMBA, AACSB), and welcomes 4,000 students and 5,000 executives from 90 different nations every year across its five campuses in Paris, London, Berlin, Madrid, and Torino. Through a combination of innovative pedagogy, cross-campus programmes with integrated curricula, and a research-active faculty, ESCP Europe is an essential contributor to the development of a European, cross-national management culture. For ESCP Europe in general and ESCP Berlin in particular an international research focus is inextricably linked with excellent teaching and high-level management training. The combination of theory and practice is a central element of ESCP Europe’s various teaching programmes. Consequently, research and development is the backbone of ESCP Europe Berlin as the school of management for Europe. The activities of ESCP Europe faculty members reach across three domains: teaching, research and academic programme leadership. Besides, ESCP Europe increasingly supports transversal research conducted with non-management disciplines, facilitated by its academic alliances and partner universities. Following the school’s strategy of innovation in teaching methods and the development of a digital campus, ESCP Europe recently has established an innovative and transparent form of learning by signing a partnership with UniShared, a collaborative note-taking platform. UniShared is a simple and inspired learning platform that makes note-taking an open, social activity by removing the physical barriers of the classroom, thus making the learning process also transparent to others. ESCP Europe is the first higher education establishment to test such a collaborative learning platform with direct contributions from students and professors. The Chair of Business Information Systems at ESCP Europe Berlin covers within its research mainly on the convergence of Knowledge Management. By that the BIS team’s research is based on the fact that learning is no longer limited to an institutional context such as schools or Higher Education, and shows how learning should be organized in different contexts, such as the workplace, or during leisure time. The main corresponding trend leading to changes for organizations and individuals is the trend of convergence. Thereby, research at the BIS chair focus on two issues: a) how learning and business processes can be integrated into a common process framework, and b) how the related systems can be integrated to enable an efficient workflow. ESCP has been continuously involved in E-Learning and knowledge-management as well as corresponding topics throughout the years by conducting research for higher institutions and practice. Furthermore, ESCP has already been part of the OpenScout project and has been both, task leader of the evaluation workpackage and project partner of the other work packages, of the project. During the OpenScout project, ESCP could extend its significant knowledge about the field of OER and is familiar with the issues on OER and all related constructs. ESCP Europe can significantly contribute to the project’s success by taking advantage of its comprehensive business and research community and its strong ties to the OER community as well. User engagement: ESCP as a business school has a strong community of learners and educators in Higher Education as well as in the business community. Therefore, ESCP will provide the main link into the business and management community. This has already been successfully performed in the project OpenScout and in various practical projects. Dissemination: ESCP has a strong publication record as well as experiences in journal and conference editing and organization. ESCP will discuss the new OEI concept with potential users: learners and educators. In a series of workshops, ESCP will discuss the concept and gather at the same time requirements to improve the initial concept. The main objective is to prepare the user community for the new idea and approach and creating engagement in the community. ESCP aims at receiving initial feedback regarding the approach and gathering further requirements. Prof. Dr. Markus Bick: Markus Bick works at ESCP Europe Berlin Campus holding the Chair of Business Information Systems (BIS). He teaches business and management information systems in the Master, Ph.D., and MBA programs of the school. His main research interests and activities are related to knowledge management, e-learning, convergent systems. This includes in the field of this proposal research / project participation in OpenScout. He actively involved in research organisations (VHB, GI) and is elected member of the SIG Mobility & Mobile Information Systems within the German Informatics Society. Danielle Leroux: Danielle Leroux will be in charge of the accounting and financial issues of the project.